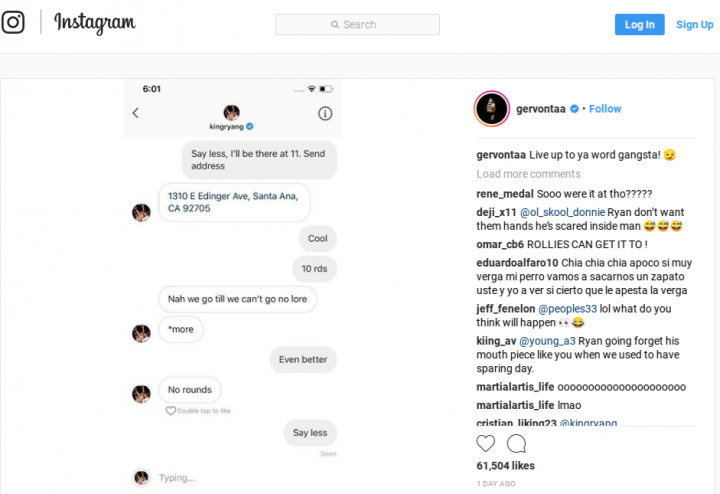 By Dan Ambrose: In what seems like a waste of time, WBA super featherweight champion Gervonta ‘Tank’ Davis (20-0, 19 KOs) plans on sparring Golden Boy Promotions prospect Ryan Garcia (15-0, 13 KOs) in order to iron out their differences due to the trash talking he’s been doing on Twitter over the last few months. 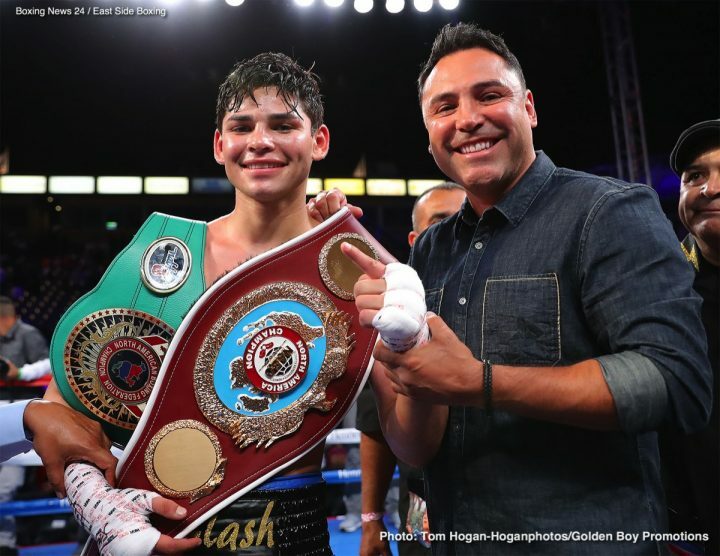 Since it doesn’t look like Golden Boy is going to risk putting the young 19-year-old social media star Garcia in with Davis any time soon, he’s decided to challenge him to spar. Garcia accepted the offer to spar with Davis. Supposedly, Davis will come to Garcia’s gym to spar with him. It’s unclear what a sparring session will prove, as the two will likely be wearing large 16-oz gloves and head gear. One only needs to watch last fight against Jayson Velez last May to know that he would stand absolutely no chance against Davis in a real boxing match. Garcia looked horrible in struggling to beat the 30-year-old past his prime Velez (26-5-1, 18 KOs) Although the judges scored it wide in Garcia’s favor by the sores 99-91, 99-91 and 99-91, the actual fight was much closer. Garcia won but Velez fought well enough to deserve four of the ten rounds. The performance by Garcia showed that he’s light years away from where the 23-year-old Tank Davis is right. It was such a bad performance by Garcia that many feel that he’s never going to be good enough to win a world title, even in the watered down weight classes in the sport. Davis wants to meet Garcia at his boxing gym so that they can spar. Presumably he plans on teaching Garcia a lesson. Since it’s just sparring, it’s hard to know what he’ll get out of it. Davis would be better off waiting for Golden Boy to one day let Garcia take the fight with him instead of sparring him in private in front of a small group of people for no money. Look at it this way. If Davis beats the brakes off Garcia sparring, then there will be even less chance of Golden Boy ever letting him take the fight with him. The last thing Davis should be doing is beating the young Garcia up sparring, because that’ll work against him. Garcia says he wants to spar more than 10 rounds. The idea is to try and wear Davis down. However, it’s unlikely Garcia will last more than three rounds unless he stays on the run, because he’s not a puncher and he’s not in the same league as Davis. The 16 ounce gloves and headgear might help Garcia service though, but obviously not if the sparring session goes more than 10 rounds. Garcia will probably need to be saved his handlers. It’ll be interesting to see if Golden Boy Promotions head boss Oscar De La Hoya will have anything to say about the sparring. The last thing De La Hoya needs is for Garcia to get beaten up by Davis and wind up losing his conference at this early stage in his career. Golden Boy has done a good job of matching Ryan against soft touches to make him look good, but it would be a mistake for them to allow Davis to get at Garcia to expose him. All one needs to do is look at Davis’ last fight against Jesus arcelo Andres Cuellar to know that he’s just so much better than Garcia. It’s not just this fight though. If you go back to when Davis first turned pro five years ago in 2013 against Desi Williams, he was always a far better fighter than Ryan Garcia is now. Davis was 18-years-old back then, younger than what the 19-year-old Garcia is now. Garcia has become popular thanks in large part to his social media following. He’s mastered social media, and because a mini-star by posting constant Twitter posts of himself and then wiping out weak opposition in his fights. Garcia hasn’t fought anyone good since he turned pro in 2016. Garcia’s last fight against Velez was a huge step up for him, and he looked bad. Since there’s no money in sparring, Garcia needs to think twice about sparring with Davis. Nothing good can come of him sparring with Tank. If Garcia’s trainers aren’t going to stop this sparring session from taking place, then Golden Boy needs to keep it from happening for his own good. Even if Davis doesn’t physically hurt Garcia, he could mentally break his spirit by battering him around the ring and making him understand how badly over-matched he is. What we’ll likely see is Garcia’s training team quickly pulling him out of the sparring session when they see that he’s getting bulldozed by Tank in the first two rounds. In order to save Garcia from being humiliated and badly hurt, his team will likely yank him out before it gets too out of hand.